daft punk — derezzed | What's Up Mann? 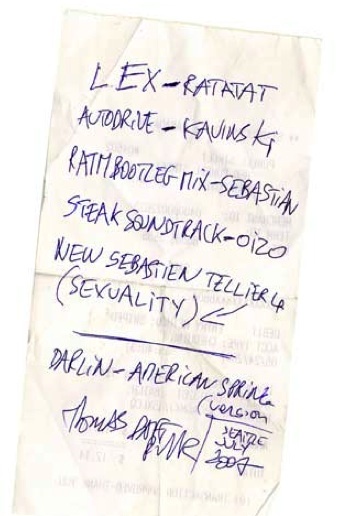 While we’re on the subject, remember that time when you were eating in a restaurant in Seattle before the Daft Punk show in 2007? And you and a buddy thought it was a little strange that the people at the table next to you were speaking French? And, after doing a quick Google image search on your phone, you determined that one of the guys was Thomas Bangalter? Then you went and talked to him and got him to write down his top five current jams plus his all-time fav tune on a receipt? You were a little starstruck and didn’t scold the man for selecting a track by Darlin’ (his first band) as his all-time favourite tune.